The problem of plastic waste is definitely a prominent issue in our society. Plastic waste is filling out landfills and polluting seas. It’s time to do something about it! 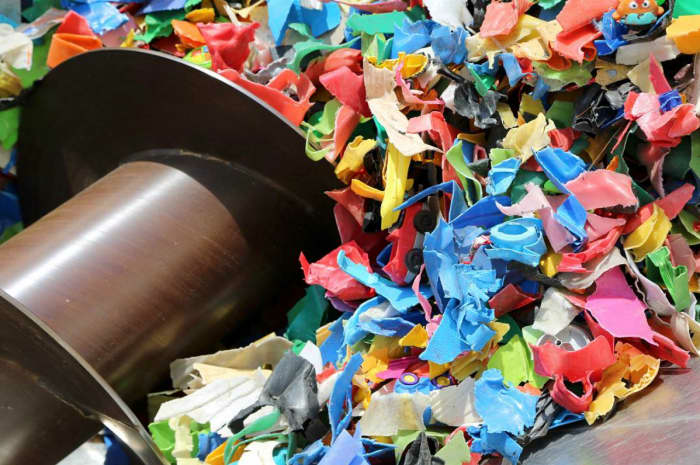 There are two main ways to approach the plastic-waste challenge: recycling existing plastic or finding alternative biodegradable materials. Some interesting solutions were presented at Milan Design Week. I have collected my favourite, that not only are great ideas to address plastic pollution, but are also not compromising on style and beauty! Among the many uses of plastic in our times, one of the most impressive is toys. Plastic is the material of which the majority of babies' and kids' toys are made of. A huge amount of plastic, that is valued about 15 times higher than the plastic used for food packaging. Additionally, toys have a very short lifecycle and are often not recycled. Bottom line, toys contribute heavily to plastic pollution and become a real environmental problem! 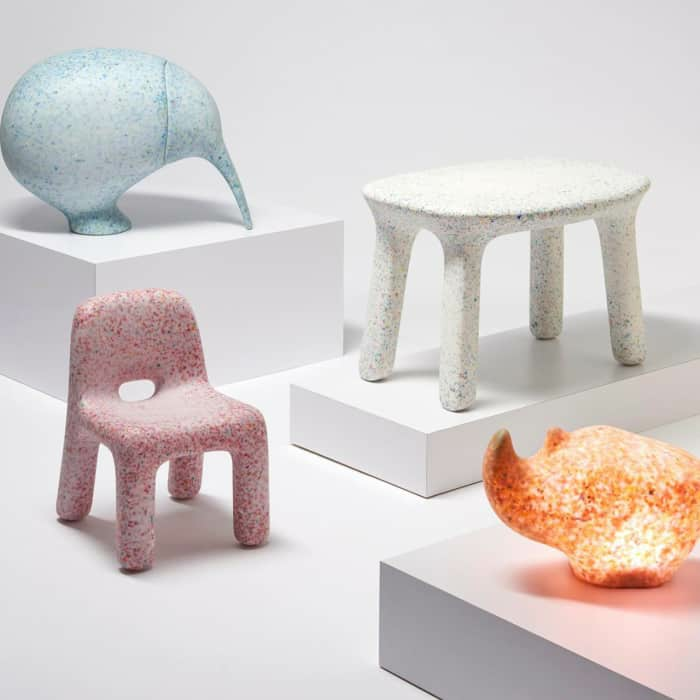 ecoBirdy is a Belgian company that transforms plastic toys into kids furniture. They have conceived a complete waste-recycling system that goes from collecting old toys, to designing and producing new furniture. First, plastic waste – namely old toys – is chopped in small pieces that are then automatically sorted by colour (thank you technology). 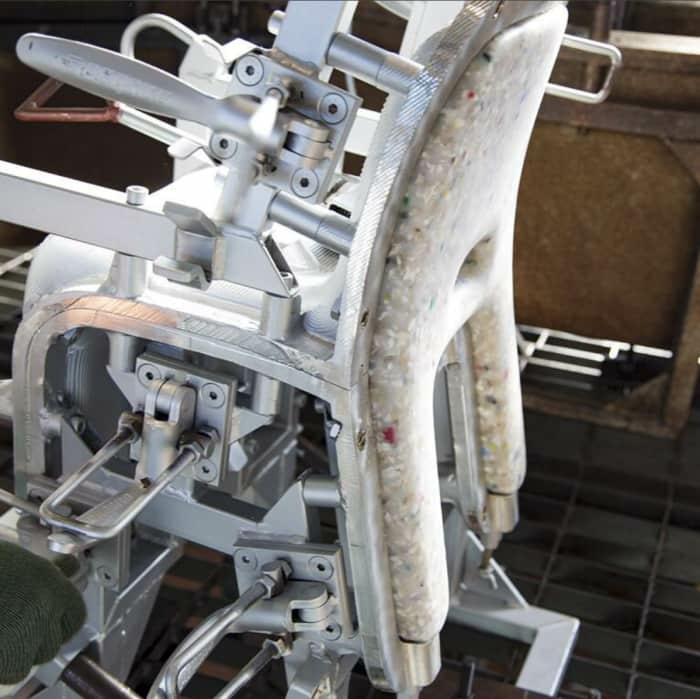 Accurate cleaning and grinding ensures that the final product is safe and free from harmful chemicals. After a lab quality control, the chopped plastic is ready to be re-used and transformed into beautiful kids furniture. 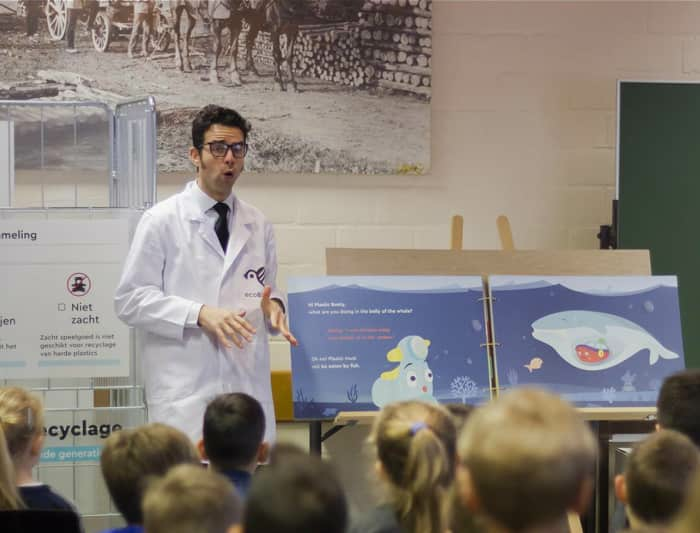 With social responsibility also in mind, the whole process of ecoBirdy is paired with a school awareness program and a storybook, that helps children familiarize with the problem of plastic pollution and understand the value of sustainable behaviours and waste recycling. 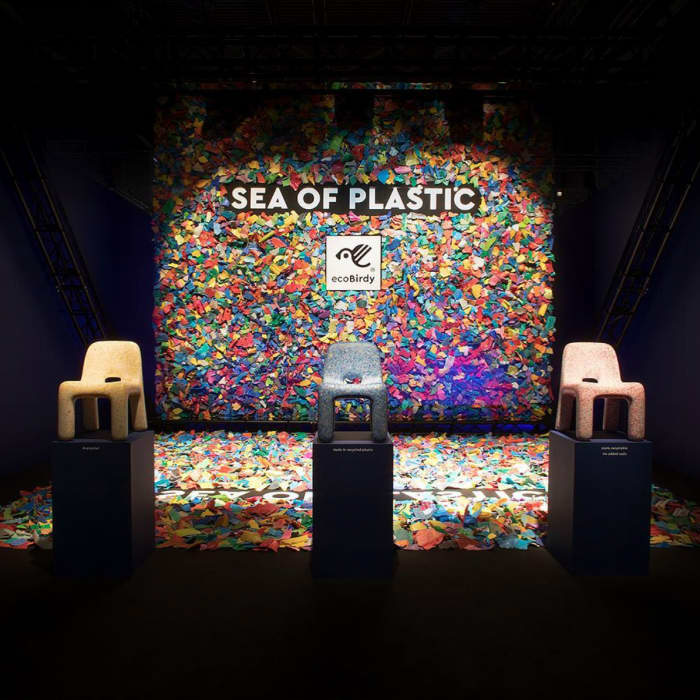 At Milan Design Week, the evocative Sea of Plastic installation was very effective in displaying the transformation of plastic waste into beautiful furniture and accessories. And here is the full collection: Kiwi the container, Charlie the chair, Luisa the table and Rhino the lamp. Aren’t they adorable? PET bottles, coffee cups … Plastic waste is everywhere and it grows every day. An original recycling option was presented at Milan Design Week by Trashpresso. 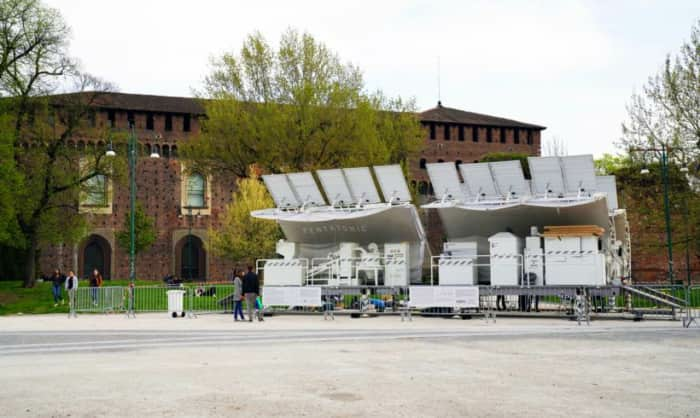 Trashpresso is the first movable recycling plant that transforms plastic waste into tiles using solar energy. The whole plant fits in a 12 meters platform that can be transported on a truck. The waste recycling process starts by chopping plastic rubbish into tiny pieces, followed by washing, drying and dehumidifying. Then, the tiny shreds of plastic waste are put into moulds and baked to create plastic tiles. Each tile allows to recycle 5 PET bottles or 100 PP bottle caps and ringlets. An air filter installed after the baking unit ensures no toxic vapour is released during melting and a water filter purifies the water used for washing before recycling it into the process. At Milan Design Week, Trashpresso baked hexagonal tiles with a nice wavy texture. But in principle they could take any shape, with applications ranging from a bathroom backsplash to an outdoor flooring. 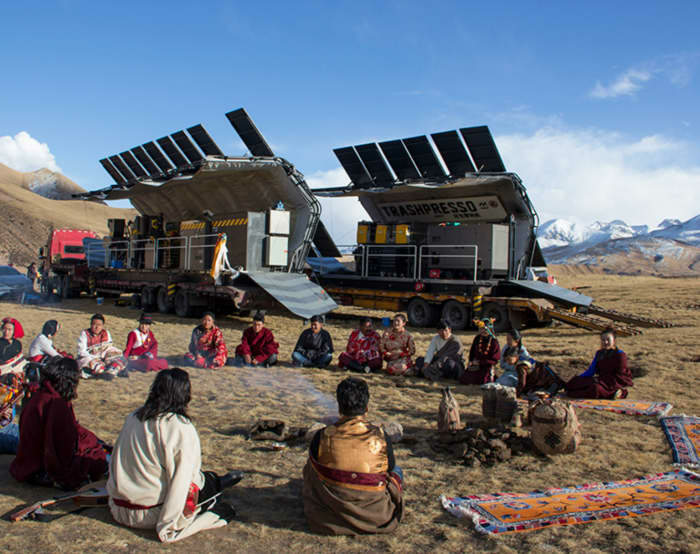 Powered by solar energy, the Trashpresso plant is completely off-grid and can be operated even in pretty remote locations, like the Tibetan plateau, that has actually been one of the stops of its demonstrative journey. The project, powered by Miniwiz, means to be an example of waste recycling and circular economy. 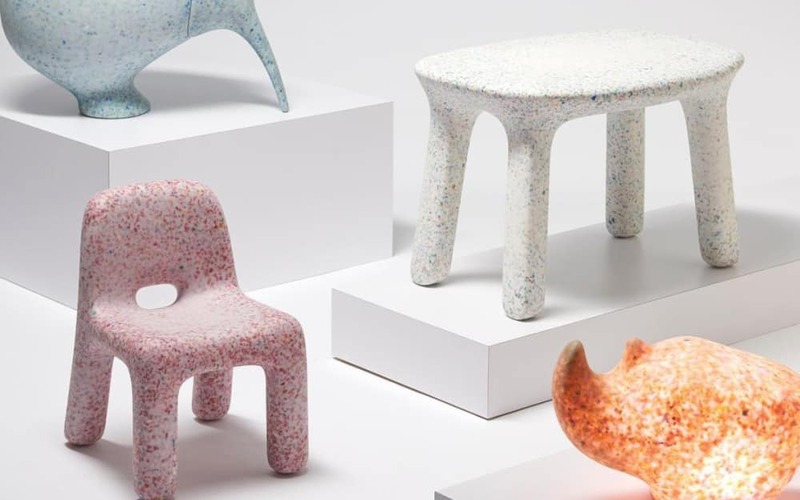 It shows how plastic waste can be turned into something useful and reused over and over again. The second way of fighting plastic pollution is searching alternative biodegradable materials. Like bioplastics, plastic polymers that are not derived from petrol and therefore don’t damage the environment. It’s been nice to see that a company that has chosen plastic as its main raw material is also interested in this topic! At the end of last year, Kartell has announced a strategic investment on Bio-on, an Italian company that develops revolutionary bioplastic materials. Fully biodegradable, these biopolymers ensure the same physical and mechanical properties as petroleum-based plastics. Plus, they are derived from agricultural waste. 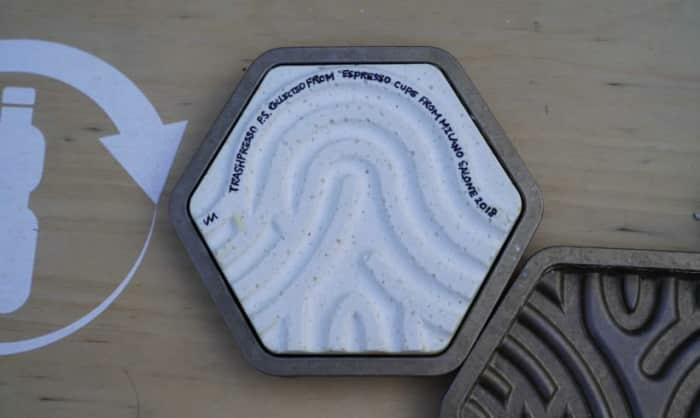 It's safe to say that the sustainability of these materials extends across their entire lifecycle, and could (hopefully) become a revolution in biodegradable materials! 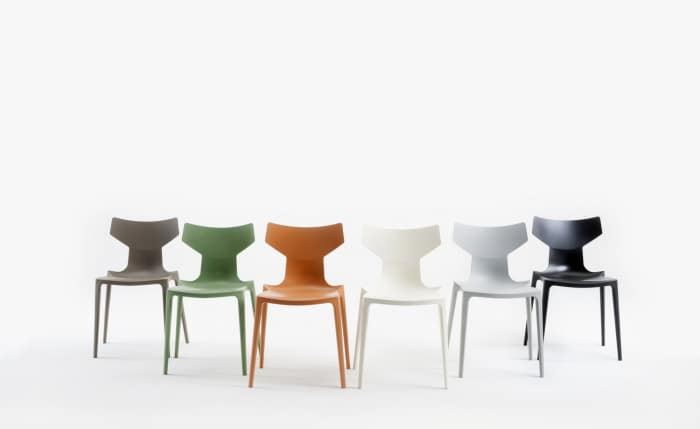 At Milan Design Week, Kartell has presented Bio chair, a new chair made of this innovative biopolymer and designed by Antonio Citterio. 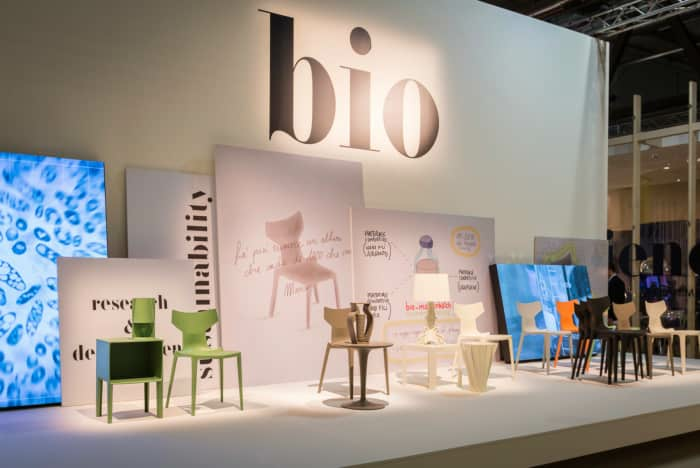 More about Bio chair in this interview to Antonio Citterio and Claudio Luti (CEO of Kartell). The exposition also featured some of the iconic items of Kartell produced with the new biopolymer. And they have nothing to envy to the ones we’re used to see! Solving the plastic-waste challenge is a very ambitious objective, but it's very much worth it and every step we can take daily is precious. 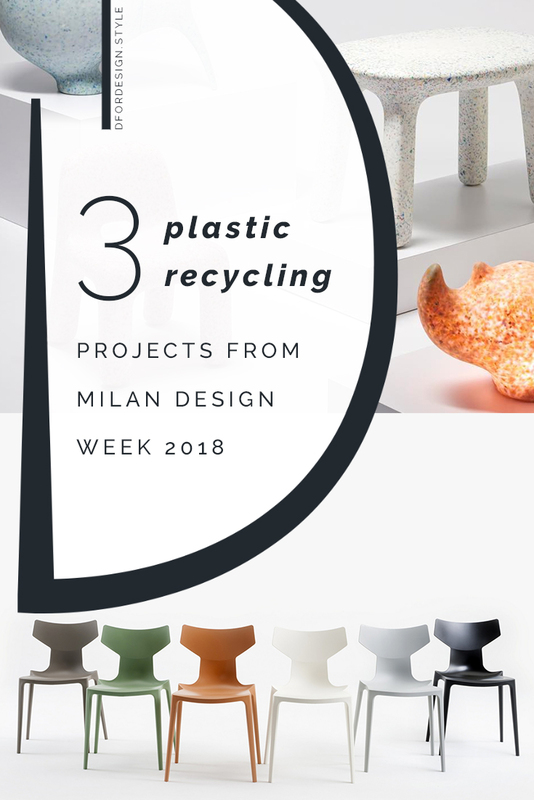 Walking through the latest Milan Design Week with sustainability in mind, I’ve really enjoyed discovering new waste recycling solutions. And I got even more excited in seeing these products and technologies, that not only can help in solving the problem of plastic pollution, but also look great! Because sustainable is also beautiful!